Psychologist | American Professional Agency, Inc. In today’s litigious society it is imperative that you have the necessary insurance to protect your Psychologist Professional Liability Practice. 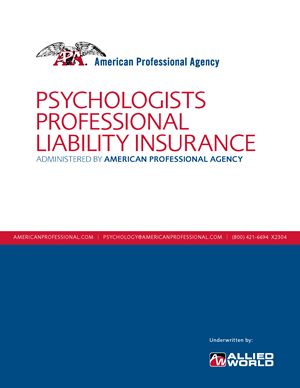 Our Psychologist Professional Liability Insurance program contains comprehensive coverage for psychologists for their practice as an employed or self-employed professional. We offer great rates with multiple premium discounts. If you practice in Iowa, Idaho, Illinois, Louisiana or New Mexico and have been granted prescribing privileges, please contact our office for a quote.